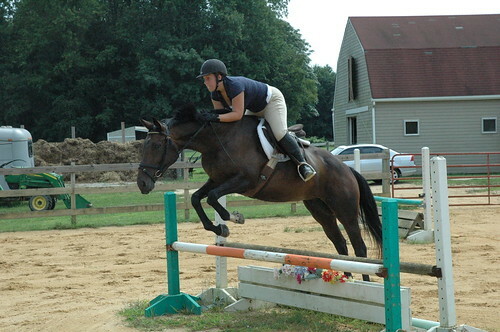 It seems like I am always mentioning my mom’s horse on my blog but I can’t help it. 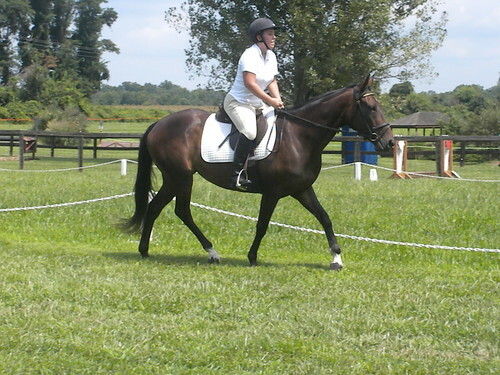 He was the first CANTER horse I had the pleasure of retraining and selling and it is so much fun to see him come along. I have seriously never met a better ammy horse then him. 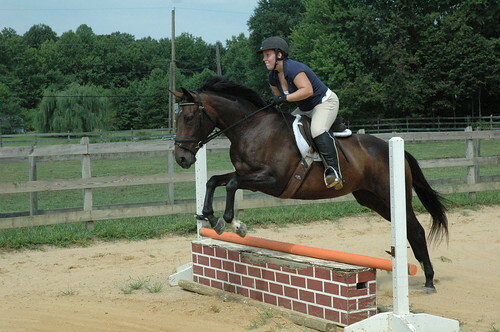 My mom has developed so much confidence simply because she can trust this horse to just do the job. 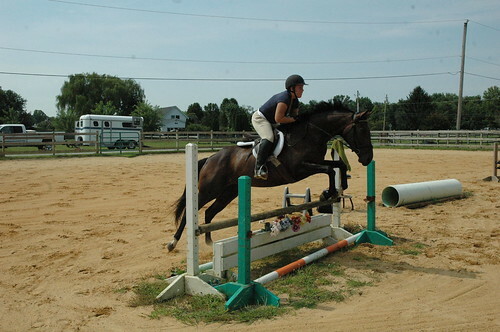 She is moving up to novice and was jumping many of the novice fences and we had so much fun watching them go. I get to push her a bit to do some of the bigger stuff but she can do it. One of the combinations was a rolltop to this uphill mound that had a log vertical on top of it. Kurt captured this picture which I love! She was really worried about jumping the trakener as she has never jumped one before but Flint cantered down to it like whatever no worries just sit still and let me do my job. I want to steal her horse he is just so super cool. I don’t think she has ever had a refusal on him at anything which is pretty amazing considering he is only a 5 yr now. We all had a blast out there schooling together. My big chestnut horse was fantastic. Hard to believe it is even the same horse. He is so confident and he has come so nicely this season. I jumped some novice fences but right now we are still making sure he stays confident so BN is our goal. 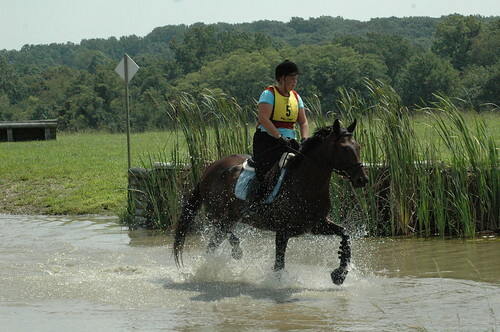 My plan was to take Rosey to the x-c schooling at Fairhill, Md on Sunday. I had been away for work all week and had come down with a horrible cold but the work still has to be done. On Saturday evening a woman called who was interested in looking at Rosey for her 14 yr daughter and wanted to see her right away so they decided to drive to see her the next day at Fairhill. 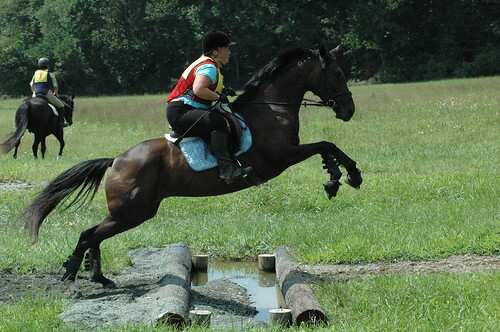 Now this was Rosey’s first x-c schooling and for anybody who has ever been to a fairhill schooling you know it can just be mass chaos. Within the first 5 min walking down the main drive we encountered a cart being pulled by a pony. Rosey was having a panic attack and I could feel her heart pounding underneath my legs. Her first reaction was to turn around and RUN AWAY. I gently walked her in circles but each time I would turn to face the cart she wanted to spin the other way. It was all very controlled and not panicked but she was scared and that was very understandable. I suppose on some horses I would have gotten down but I know Rosey and knew she would be okay with a minute or two of circling. I was able to get her to walk past it but she really didn’t want to go and kept her eye on that cart the whole time. The people were wonderful (thank you!) and had just stopped to make sure the cart didn’t move as I was walking by it. She was a bit jazzed up from this experience and of course the people who are there to see her were following me down in the car seeing all of this. I think they were a bit concerned but I thought she handled herself with amazing poise because a cart + pony is very scary. She kept her mind in the game the whole time and was listening to me. They opted to ride her in the enclosed ring so we walked down there and were faced with our first loose horse of the day who came galloping right in front of her. That always is exciting but she didn’t seem to be affected by that. We walked what seemed like a mile to me (I was on foot) mainly because I was sick, hot and already exhausted. Rosey always amazes me with how brave she is. There is a concrete pad that water runs across and she walked right across without a blink. The girl rode her in the ring and that went really well. She was nervous (of course riding a strange horse is hard!) but Rosey was very patient and they came together nicely. We pulled out a brick box and set that up in the ring and she jumped it from the trot and canter getting a variety of distances all of which Rosey happily jumped from. Rosey stayed very quiet and relaxed and you could see they were both very happy together. I got back on Rosey for a brief schooling mainly because I was feeling yucky but wanted to do the ditches, water and banks so I could enter a BN with confidence. I should have known that nothing would be an issue with Rosey. She walked right over both of the ditches very nicely although the first trip down she was going OMG water in the ditch and stopped and then did a big leap. She got a bit nervous with the big groups of horses so I just kept her moving. We trotted over to the water and she trotted right in and had the cutest face just as happy as could be. She loves water and frequently plays in the big puddle in her paddock at home so I suppose this was no big deal to her. I don’t know if she had ever seen a bank before but the fairhill bank is fairly narrow and about 2’3″. She walked up it without a care in the world and then gently dropped off. I ended with that and gave her lots of praise. She was quite relaxed until we came across the man riding a blue bike pulling a blue baby carriage. She did spin me around and I just chose to canter a circle and stay away from this blue bike. Heck that thing scared me no need to scare her as well. She got a nice sponge bath and I unloaded by other horse and put her back in the trailer. She stood so quietly you wouldn’t have even know she was on there. Even when I rode back with my other horse she never even made a noise. She is the easiest horse to deal with and she has such a great attitude. I forgot to mention I jumped some very solid BN/Novice fences making me way from the water to the bank and she was so brave and jumped them with tons of scope. Man this girl can really jump and she loves it. I got a call that the people loved her and want to take her on trial so she will head off next week to see if she wants the job of being a pre-children’s jumper. I am currently in Washington D.C. for a work trip this week so not much to report but before I left we did get a new arrival which is always exciting. Working the Delaware Park program keeps life interesting as there is always something going on at the track that I am working on. 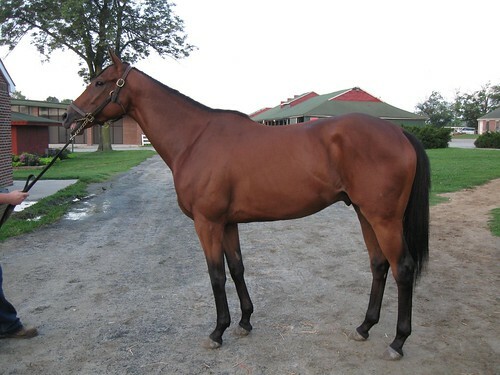 We got word that a trainer needed some help placing a 3 yr he had that just wasn’t going to be a racehorse. We had already planned on shifting some horses around and I had a stall so of course it got filled the day it opened up. 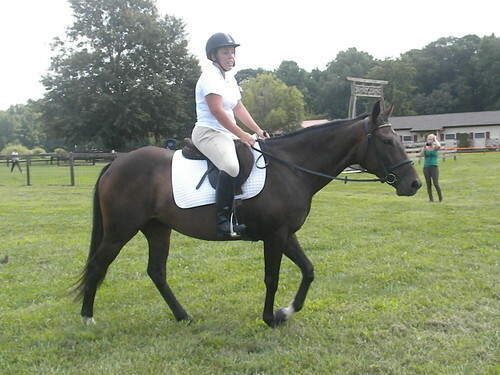 Meet Sea Flip – 3 yr 16 h gelding. He was so cute when arrived late at night around 8pm but a storm was approaching. He spent the night relaxing in his stall apparently he was tired as I found him flat out when I came out to feed the next morning. He clearly was not stressed by his move. He transitioned to turn out super easily. He got his feet done while I have been gone this week and I will get started with him when I get back so I am very excited! 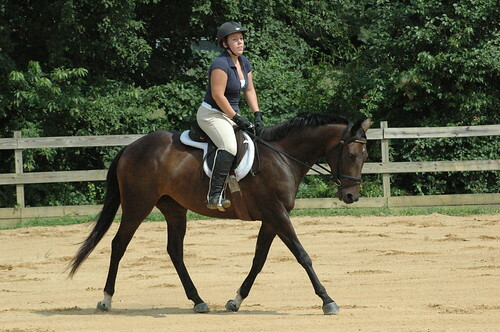 In other news, Archie went to the CANTER farm in Md for some more turnout time. He is coming around just needs a bit more time and we really believe it is important to give them as much time as needed. Escape by Sea is a work in progress because she is suffering from poor quality feet which are not holding shoes. She also got glue on shoes while I have been gone so that should allow me to finally start riding her! My goal is to get Rosey to a BN this month so the plan is for a x-c school this Sunday at Fairhill, then a clinic on wednesday with Steuart Pittman and then enter her if all seems on track. My horse finally got to his first event and went clean stadium and x-c to finish on a dressage score of 31 so I will take that for a first event! He was excellent and Carousel Park is a beautiful facility and the DVCTA runs an excellent show. There is always a lot going on at the farm and horses coming and going. I am suprised..shocked..annoyed that nobody has called to come and see Rosey. I suppose it will be my job to prove her worth which I am happy to do. I believe she has a bit to prove and am excited to show her off. Etrain is still hanging out getting his rest. He has some issues with his ankle and we are giving it some time before we decide what way we will go with him. He is the sweetest horse you could ever want to be around. First event and a ribbon! Rosey headed off to Oldehope for her first event on Friday. She was filling in for Junior who got the stick in his foot. 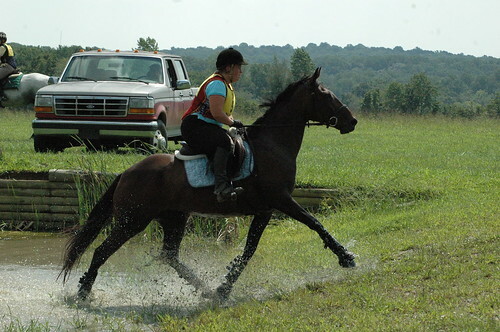 Tara was also doing her first event and although sometimes a green rider with a green horse is a disaster I was confident Rosey would handle herself like a pro. We weren’t wrong about that! She got off the trailer and was just munching her hay bag oblivious to the chaos around her. Headed down to warm up for dressage and was the only horse in this small area stuffed between dressage rings and she couldn’t have been more relaxed. 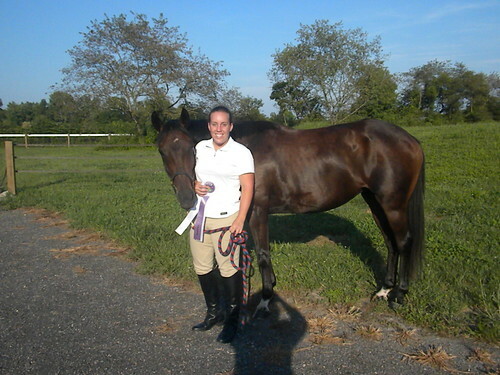 This was Tara’s first ever dressage test and I thought she did well for her first time! It is hard to replicate the patterns at home even when you mark it out. I see she got a bit confused in her first turn and circle but it got better from there. We are working on converting her from the hunter perch but it still is a work in progress as it is for all of us. If she had gotten the correct lead she would have been 1st or 2nd after dressage out of 13 people but she was 4th so for the first time we will take it. 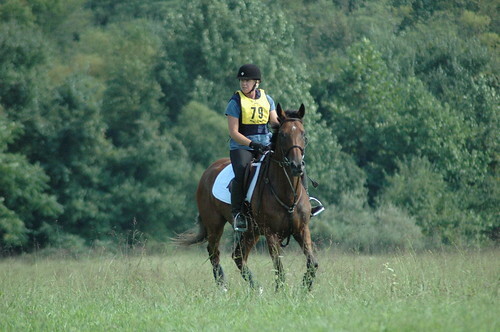 Not to mention this is Rosey’s first time ever seeing a dressage ring! The course was a little elementary where you went straight from stadium to x-c and weaved in and out of some big fields. Tara was extremely nervous and it didn’t help that the two people in front of her started off rough with a fall and then an elimination. Rosey had her game face on and I told Tara to look up, leg on and keep her going forward. Sit back and keep the shoulders up. Rosey jumped everything like she had been doing this forever. I think she thought we were joking with these tiny fences but it is all about giving them confidence and she was very confident! She ended up 4th and I think her head might be a bit to big to fit in her helmet now. I am glad it went well she has been working really hard with the horses this summer to learn a bit of dressage and become more confident jumping out of the ring. It is easy for someone who grew up riding out of the ring but it does take a lot of practice. I can not tell you how amazing Rosey is. I realize it is just elementary but it wouldn’t have mattered if it has been Novice. This is one nice mare and she is just so calm and easy. The goal will be to keep adding a variety of mileage to her to enhance her sellability (is that a word :)) I plan on taking her BN soon but she is also good enough with her knees to do the hunters. We will just enjoy her until she sells which is hopefully quick. Rosey has been coming along so quickly due to her extremely willing nature. She is very very smart! I have been riding her a few days a week and then the students get on her in between my rides when things get a bit hectic around the farm. This week the horse that my friend is leasing from me decided it would be fun to impale himself with a stick through the coronary band. He will be fine but he also received bad news on his recent x-rays showing his bone spurs are getting bigger. He had an injury to his knee about this time last year and has been on a slow recovery plan. We had slowly increased his workouts to include jumping and longer trail rides and the bone is just not reacting well so he is getting his workouts scaled back. Friend has signed him up for Oldehope this upcoming Friday for her first event ever at Elementary but he may not be ready to go due to his foot injury. Rosey to the rescue 🙂 Let’s get her ready for elementary at Oldehope in a week. At first my friend didn’t like her. You know the whole riding green horses thing isn’t for everybody but truthfully I sent her an email expressing my thoughts which were that at some point in time you have to LEARN to ride a green horse and push out of your comfort zone. Rosey is perfectly safe and would be a good project to slowly push out of the comfort zone without scaring anybody. She took my advice and decided to give it another shot. I helped her find the buttons and voila all of a sudden total change of heart which is nothing less than what I expect. 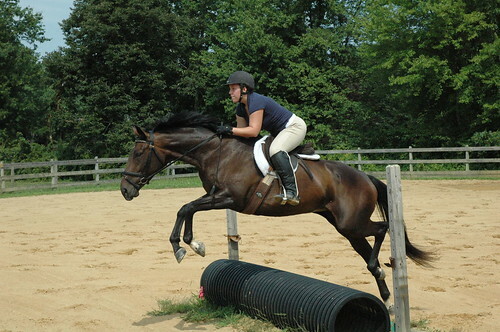 I ride a ton of green horses and Rosey is beyond easy on the scale of green. Show her something and she picks it up right away. She is quiet, not spooky, brave and comfortable. A good jumper but won’t do anything that will scare you over a fence. Tara has been riding her in between my rides this week. It is so interesting to watch the progression that this mare has made since her arrival. She needs a bit of a tough ride to make her understand she need to jump the jumps but let me tell you she has had a lightbulb go off recently in regards to jumping. Now she sees the jumps and is going. Today we went off for a field trip to my mom’s house and Rosey flat out suprised the heck out of me. 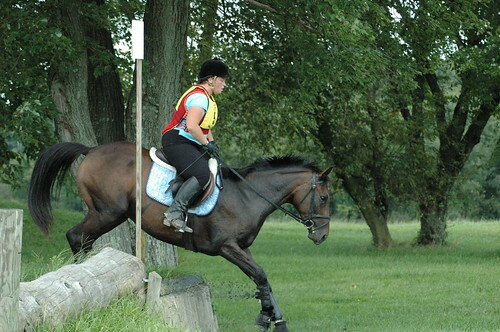 I would have to look back to see when she was last there maybe 2-3 wks ago but she had not a clue what a jump was. Walk jumping was the goal of that day as she said no understanding of jumps or the jumping motion. Cool..we have worked steadily on showing her different jumps and keeping them low to build her confidence. She was cute on the flat today and of course went around without a care in the world. We warmed up over a little coop which she had walked over last time. This time she perked her ears up and suprised Tara by charging toward it 🙂 We went and jumped the scarier jumps as singles first- black pipe, barrels, brick wall and flower box. She didn’t even look at them. Well I shouldn’t say she didn’t look because we did get this funny pic of the black pipe. If you remember Rosey and I had a bit of a conversation about the black pipe in my field at home and it took me 5 min to get her over it so I will take this! Only issue was when I raised the flower box to an oxer 2’3 maybe 2’6″ and Tara had a bit of confidence issue along with steering. Rosey needs you to ride her perfectly straight at this point. She was bulging out her right shoulder and just stopped both times but I told Tara this mare could jump that in her sleep now get her straight, look up and squeeze at the base. She jumped it so round! I put a course together and Tara was having a bit of a panic attack because there were things she hadn’t jumped yet but I reminded her we want to practice riding an unknown course. There was a line 2 stride to a 3 stride and I told her find a point at the end of the line and use your legs to ride her between your hand and leg like a chute. A bit of low and wide hands to help guide her. This is one nice mare! 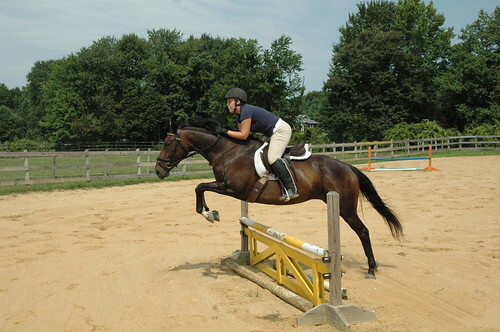 She tries so hard and is just a fun horse to ride. 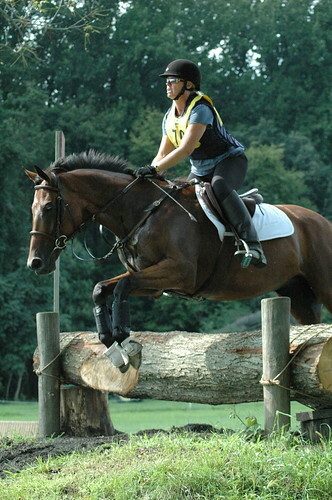 She will be making her eventing debut on Friday so check back! Why I say make sure you wait with your shoulders or else you will get jumped off. She can really use her neck and back and Tara almost got jumped out of the tack. Funny! This week has just been one where riding wasn’t necessarily at the top of the list. This humidity and thunderstorms that tend to pop up everyday at 4pm really make riding difficult. I was going to ride Rosey yesterday but we got home late from our track visit and by the time we finished up farm chores it was already 7pm and I was exhausted! We got slammed by some more storms today but they passed over just leaving it feeling like a sauna. Rosey was happy to come in for some attention. This mare is just so fun! She didn’t forget a thing and went around so soft and relaxed. Right now I am riding her in a myler comfort snaffle which she seems to like. I am working on getting her a bit softer in the bend each direction with some slight flexions and baby lateral work. She is good off the leg just a bit unsure of what to do. Overall, it just feels like she doesn’t steer as well as she could so I really get both legs around her and make her understand she must stay straight between the hand and the leg. She struggles with the transition from trot to canter wanting to rush into it so I need to get the dressage whip to tune up this transition. She understands I am asking her to canter but the response is just not sharp enough. I find it hard to use the jumping bat in the same way. 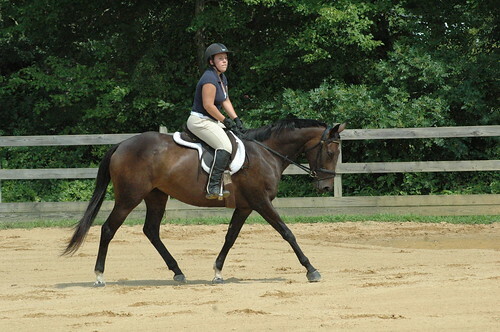 I really want her to understand the leg means canter not trot faster. I will use it a bit sharp and praise her for a quick response until she understand what I am asking. I didn’t know what to expect with the jumping today but boy did she impress me. She didn’t blink an eye at anything and stayed right in the middle with no refusals. She was forward thinking and I could feel how great she was jumping underneath me. 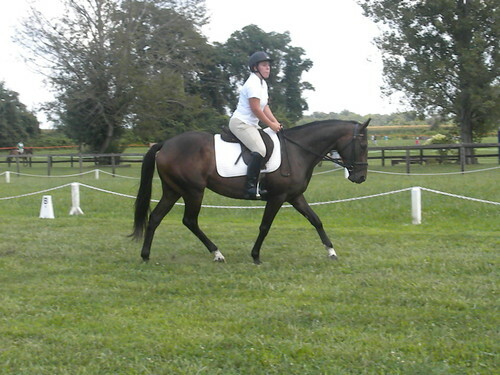 I am still trotting everything and probably will be for a bit longer until she understands how to stay straight. I think my student is still learning how to put a horse between the hand and the leg but she has been doing good because obviously Rosey is jumping better than the last time I jumped her. She has went from lacking confidence and understanding to now wanting to take me to the jumps. LOVE it!!! She has a great work ethic and more than anything she is just so sweet to work with. Her buddy is in the barn screaming but she could care less. She is always eager to please and I can really appreciate that in a horse. She also really thought it was tons of fun to go trotting/cantering through the huge water puddle that is in the ring at the moment. Kurt and I love our mares because they are smart enough to use their run in shed. They hang out in there a lot to stay out of the sun, bugs and rain. I bring them in every night to feed them dinner but otherwise they are just happy hanging out. Rosey and Bella both need shoes…hopefully my farrier and I can get something for this week.